The WCO is among the impressive range of contributors from policy, enforcement and academic circles who contributed to the 2015 volume of the Palgrave Studies in Green Criminology, titled ‘Environmental Crime and Collaborative State Intervention.’ The book sheds light on how collaborative networks form in the context of the fight against environmental crime, and what opportunities they offer for all stakeholders. Throughout the last decade, transnational environmental crimes, that comprise activities such as the illegal transportation and dumping of toxic waste, the illegal trade in endangered species of wild flora and fauna, illegal logging, and the illegal trade in ozone-depleting substances, to name a few, have attracted the attention of policy makers at the highest levels. These crimes have also resulted in the formation of different models of collaboration within and across governments with law enforcement agencies, non-governmental organizations (NGOs), academia, the private sector, consulting agencies, prosecutors and courts, and civil society. 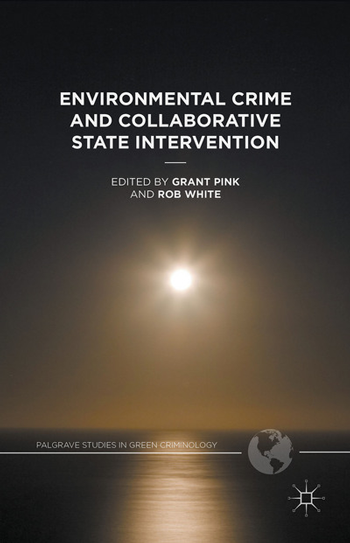 The 2015 volume of the Palgrave Studies in Green Criminology, titled ‘Environmental Crime and Collaborative State Intervention’ and edited by Grant Pink from the University of New England (Australia) and Rob White from the University of Tasmania (Australia), offers a unique account of the different governance models adopted by these collaborative networks from the inception to the maturity stage. The book sheds light on the latest developments in the field of environmental collaboration, and presents the perspectives and experiences of major stakeholders, as well as lessons learnt. From the very first pages, the role of collaboration in combating environmental crime is discussed, with an emphasis on both the theoretical underpinnings of collaboration through networks, and the definitions of transnational environmental crime. Stemming from the definition of environmental crime as a crossover crime, given its transnational and multifaceted nature, the authors underline that the response of all stakeholders as a whole is critical in tackling it. The distinguishing among three major types of collaboration – horizontal, vertical and diagonal – provides a useful analytical framework when examining the different types of existing collaboration which are discussed in the book’s different chapters. Several chapters provide an up-to-day account of the networks built by national governments and international organizations, as well as their contribution to fighting environmental crime. Among them is the International Network for Environmental Compliance and Enforcement (INECE), one of the most prominent trans-governmental networks, considered a catalyst for practitioner and academic writing in this area. In its more than 25 years of existence, the INECE has grown from an informal bilateral mechanism to a global network that has influenced the establishment of more than 20 networks focused on building the capacity of civil servants in the area of environmental compliance and enforcement. The strength of this volume lies in the variety of stakeholders that have contributed to it. The WCO, the Secretariat for the Convention on International Trade in Endangered Species of Wild Fauna and Flora (CITES) and INTERPOL provided detailed analyses of the way they addressed environmental crime, as well as on the networks they have built, such as the International Consortium on Combating Wildlife Crime (ICCWC) – established by the WCO, the CITES Secretariat, INTERPOL, the United Nations Office on Drugs and Crime (UNODC) and the World Bank, or the National Environmental Security Taskforce – established by INTERPOL to enhance collaboration among relevant stakeholders at the national level. A special chapter is dedicated to the role of Customs authorities in combatting illegal wildlife crime. It provides an analysis of the limitations of Customs functions and of the different initiatives taken in order to tackle identified weaknesses, implying a high degree of collaboration, including the implementation of capacity building programmes, organizing regional and global operations, forming new alliances with NGOs and other institutional partners, and developing secure electronic systems for information exchange, such as the WCO’s ENVIRONET. One interesting finding which was mentioned in several chapters is the increasing role of NGOs in the sphere of environmental protection, since they have proven to be catalysts for change due to their flexible structure, strong voice and ‘feet on the ground’. In many instances, NGOs played the role of incubators and stimulators of wider governmental action on environmental crime. The prosecutor’s perspective on the collaborative relationship with the courts, based on the United Kingdom Environment Agency’s (EA) experience, is also interesting not only because it provides the latest casework in this area, but also because it contains lessons learnt on the role of the EA in the regulatory sphere. A chapter on port-to-port collaboration would be of particular interest to enforcement professionals. Established in 2008 as an offspring of the INECE to tackle hazardous and electronic waste in the seaport environment, the Seaport Environmental Security Network (SESN) has proven successful in promoting cooperation to prevent, detect and disrupt the movement of illegal hazardous and electronic waste through ports. Customs authorities in particular have been actively engaged in the Network because of their central role at seaports. The unique characteristic of the Network is its flexibility in terms of approaches to collaboration that vary from very informal to formally established mechanisms, and include national, regional and international dimensions. In the Netherlands, the partnerships between the Human Environment and Transport Inspectorate (ILENT) – responsible for inspecting waste transport – and enforcement agencies – such as the Customs and Police services – have been formalized in order to enable the latter to exercise their power on behalf of the ILENT. While in Germany, another model prevails, based on the principle of semi-structural interagency collaboration along the infrastructure (rail, road, and inland waterways), both at the local and national level. The last three chapters of this volume are dedicated to the role of research from a collaboration angle. Difficulties related to the quantification and understanding of the phenomenon of transnational environmental crimes and their impact, may lead to ineffective policies and a waste of resources to fight against this scourge. The complex nature of environmental crimes created a need to collaborate in order to produce a more holistic picture and contribute to research. The book also addresses collaboration between researchers and practitioners. While this type of collaboration is emerging in a number of countries and is supported by different actors, the gap between academics and professionals is wide and collaboration between the two is not self-evident. Overall, coordinating research efforts is not an easy task. Therefore, case studies on the successful coordination of research projects that involve different partners contribute substantially to this volume. The novelty of this book is in its unique format, discussing the strengths and weaknesses of different collaborative efforts to fight against environmental crimes from a governance perspective. The volume itself is a product of collaborative efforts as it required experts from different institutions – at least two – to work together on each chapter. While the constraints and challenges in building and maintaining networks to fight against environmental crime differ, one of the major lessons learnt is that collaboration and mutual trust are the key prerequisites for success. Overall, this book can serve as a good reference, not only for environmental professionals wishing to learn more about the latest achievements in this field, but also for enforcement officers, development experts, and researchers working on governance issues in the environmental domain.